You can delete one of the panels by right clicking and then selecting "Delete This Panel". But that can't be done for the last panel left on your screen. That needs a bit of extra work. Notice that you need to run gconf-editor as the normal user. So, no application of sudo, gksu, gksudo here! 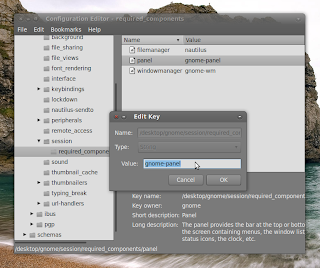 Navigate to desktop > gnome > session > required_components, double-click "panel" and delete "gnome-panel" from "value" field. Press OK and re-login. All the panels should be gone then. If you want to bring back the Gnome Panels, follow the same procedure as above but re-enter "gnome-panel" into the "value" field. Remember, you'll lose the Alt + F2 functionality if you disable all the panels and will need to run gconf-editor from Terminal instead.